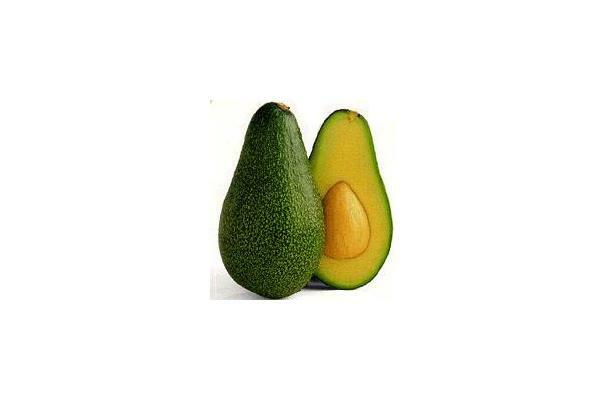 Avocados are pear shaped fruits with dark green to purple-ish black colored skin. The flesh which becomes buttery soft when ripe, is light green near the skin becoming yellowish toward its single, ovoid seed in the center. Often used to make guacamole, avocados are great eaten raw on their own or in salads and salsas. They're also a wonderful ingredient in soups, or as a topping for burgers or sandwiches. The skin is bumpy, green, and dark brown. Avocados are about the size of a pear. The flesh is green and yellow. It contains a pit that needs to be removed before eating. The texture of the flesh is soft and creamy. Choosing: Availability will depend on person's location. Typically they are in season April through September. Buying: Can be bought at any grocery store and Latin market. Procuring: Grown in Mexico, South America, and Central America. Avocados grow on trees. Popular in salsas and Latin dishes. Cut avocado in half and twist to separate. Use a spoon to scoop out pit. Peel the skin off from the flesh. Cleaning: Clean with cool water and a paper towel to avoid contamination once opened. Store unripe avocados in a dark place or brown bag. Use ripe avocados right away. Mexican guacamole, a blend of the pureed flesh with lemon or lime juice, onion juice or powder, minced garlic, chili powder or Tabasco sauce, and salt and pepper has become a widely popular "dip" for crackers, potato chips or other snacks. The ingredients of guacamole may vary and some people add mayonnaise. Because of its tannin content, the flesh becomes bitter if cooked. Diced avocado can be added to lemon-flavored gelatin after cooling and before it is set, and chunks of avocado may be added to hot foods such as soup, stew, chili or omelettes just before serving. In Guatemalan restaurants, a ripe avocado is placed on the table when a hot dish is served and the diner scoops out the flesh and adds it just before eating. For a "gourmet" breakfast, avocado halves are warmed in an oven at low heat, then topped with scrambled eggs and anchovies.